Paul Menard and the No. 21 Menards/Dutch Boy Ford Fusion will start Sunday’s Big Machine Vodka 400 at the Brickyard from 19th position after rain washed out both practice and qualifying at Indianapolis Motor Speedway. Menard’s starting position was determined by his team’s position in the owner points standings. The start of Sunday’s race will be moved up one hour, to 1 p.m., a move intended to take advantage of any clearing skies that might allow the race to be completed on Sunday. With no teams getting on track at Indy prior to the race, Menard and the Menards/Dutch Boy team will have somewhat of an advantage in that they participated in a recent practice session at Indianapolis. That session was run during a rainy period with temperatures similar to what is expected for Sunday. 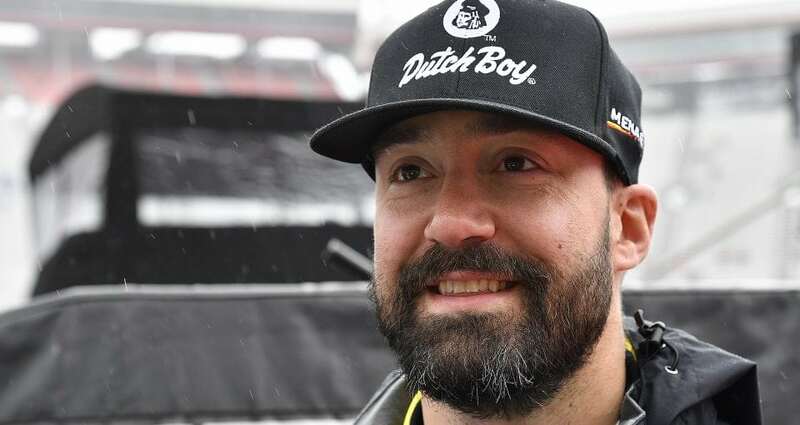 And Menard said earlier that he felt good about what he and the team learned during the test and hopes to apply the new-gained knowledge to Sunday’s set-up. Eddie Wood said that despite the rain he has few complaints. “It wasn’t that long ago that we were missing the starting field when it rained out qualifying,” he said, referring to the team’s days running a limited schedule with no guarantee of a starting spot for races. “I do feel bad for the fans who have been inconvenienced and for the people who work at the race track and have put so much effort into this event. Sunday’s 400-miler will be broadcast on NBCSN.